COLORADO SPRINGS — Three launch vehicle developers, one of which is still in stealth mode, have qualified to compete in a DARPA competition in early 2020 to demonstrate responsive launch capabilities. Industry sources believe that the stealth company is most likely Astra Space, a company developing a small launch vehicle that suffered two failed test launches last year from Pacific Spaceport Complex-Alaska. Master said that two companies are using ground launch systems and that none of the companies have yet to put payloads into orbit, characteristics consistent with Astra Space. As part of the competition, the three companies will first attempt to launch payloads into orbit in January or February of 2020. The exact launch window and location, which will be selected from a set of spaceports announced last November, will be revealed to the companies about 30 days in advance. Each company that is able to place a payload into orbit will receive $2 million and then perform a second launch from a second site, also on short notice. The companies will that perform the second launch will be eligible for a $10 million first prize, $9 million second prize and $8 million third prize. The companies will be ranked on a number of factors, with a particular emphasis on speed to launch, Master said, although DARPA is still developing the scoring algorithm. Other factors, he said, may include orbital insertion accuracy and mass to orbit. The qualifying companies, which each received $400,000, came from an initial pool of 55 companies that attended an industry day last May in Los Angeles. More than 30 teams submitted their launch concepts through a “pre-qualification” process. 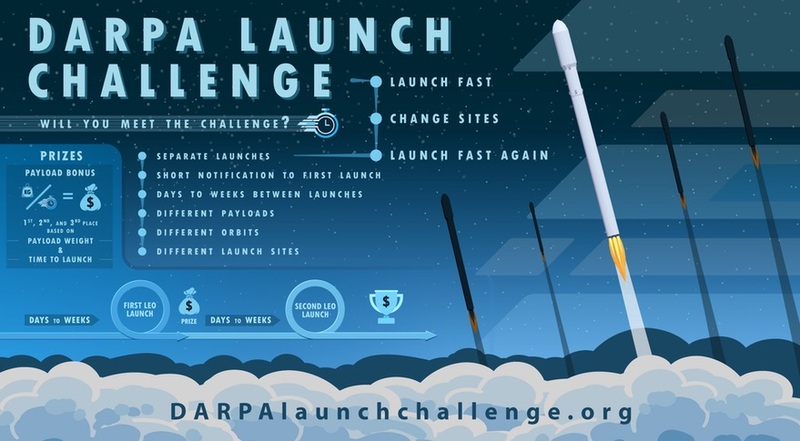 DARPA then selected 18 teams to continue into the full qualification process, which required companies to offer more technical details while also going through the commercial launch license application process with the FAA. The selection of 18 companies from more than 30 who entered the pre-qualification process, he said, was based on which companies were offering a feasible concept within the timeframe of the competition. “We saw a lot of interesting ideas, but in a lot of cases there was no actual hardware development to date, or no software development to date, or no safety considerations for licensing,” he said. Master defended the decision to hold the competition now despite the limited number of companies qualified to compete. “We very specifically chose the timeframe of this challenge when it was,” he said. The intent was to get companies in the early stages of vehicle development “prioritizing responsiveness and flexibility such that it could still be enacted” before their designs became too mature. Another issue yet to be addressed is how any prize-winning companies might transition to contracts with U.S. government agencies to provide launches for them. Air Force Gen. Jay Raymond, head of Air Force Space Command, was “extremely interested” in the results of the competition after a briefing about it last year, Master said. There’s also interest from the Defense Innovation Unit. “But we don’t have a specific procurement plan yet or a direct contracting mechanism” for the winning companies, he added.